UPDATE: Due to weather, the concert has been cancelled. Blacksburg High School hosts a United States Navy Concert Band Performance on Wednesday, February 20, 2019 at Blacksburg High School Auditorium. The United States Navy Concert Band brings their 2019 National Tour to Blacksburg. The United States Navy Concert Band, the premier wind ensemble of the U.S. Navy, presents a wide array of marches, patriotic selections, orchestral transcriptions and modern wind ensemble repertoire. As the original ensemble of the Navy Band, the Concert Band has been performing public concerts and participating in high-profile events for over 85 years. Collaboration with celebrities has become a hallmark for the Concert Band. The band was featured with Arthur Godfrey of NBC radio fame in 1927. Gene Kelly was guest star for the first episode of "The Navy Hour" radio program in 1945, which the band produced for an astounding 23 years. More recently, the band featured guest artists Tony Curtis and Gregory Peck. In 2002, the band was filmed performing "America the Beautiful;" the performance was broadcast by the NFL prior to each game during opening week. Recognized as one of the finest wind ensembles in the world, the Concert Band is in constant demand by the nation's foremost musical education organizations, such as the American Bandmasters Association and The Midwest Clinic. In addition to national concert tours and an extensive local concert season, the Concert Band has been featured internationally at military tattoos and festivals in Oslo, Stockholm and Quebec City. In 1996, the band was honored to participate in the 300th Anniversary of the Russian Fleet in St. Petersburg and in The Baltic International Festival of the Fleets in Kaliningrad, Russia. One of the primary responsibilities of the U.S. Navy Band is its national concert tour. Rather than a single tour, the Navy Band’s national concert tour is a collection of tours throughout the year by the various units of the Navy Band. These tours provide the opportunity to reach out to audiences in areas of the country that may not see the Navy’s premier musical ensembles on a regular basis. Tickets are required, but are free. To reserve tickets online, visit: https://blacksburg-high-school-band.ticketleap.com/navyband/dates/Feb-20-2019_at_0700PM. To view the event flyer, visit: https://i.imgur.com/cs6qRat.jpg. 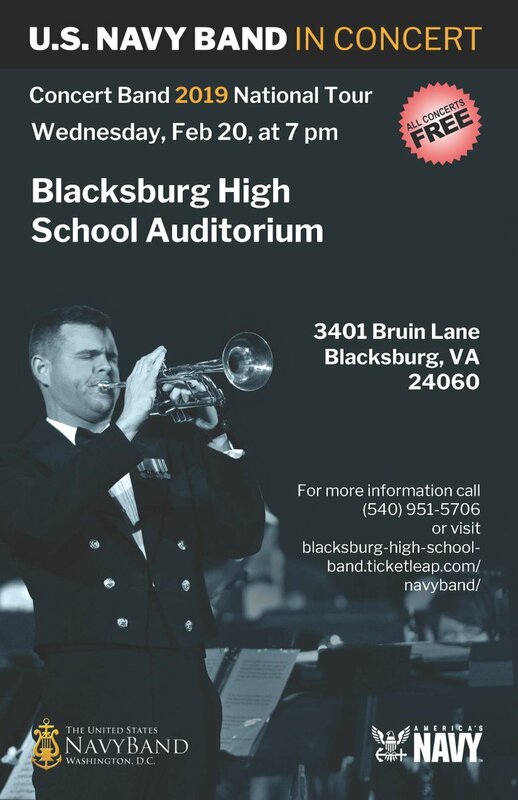 For more information, call 540-951-5706 or visit https://blacksburg-high-school-band.ticketleap.com/navyband/.